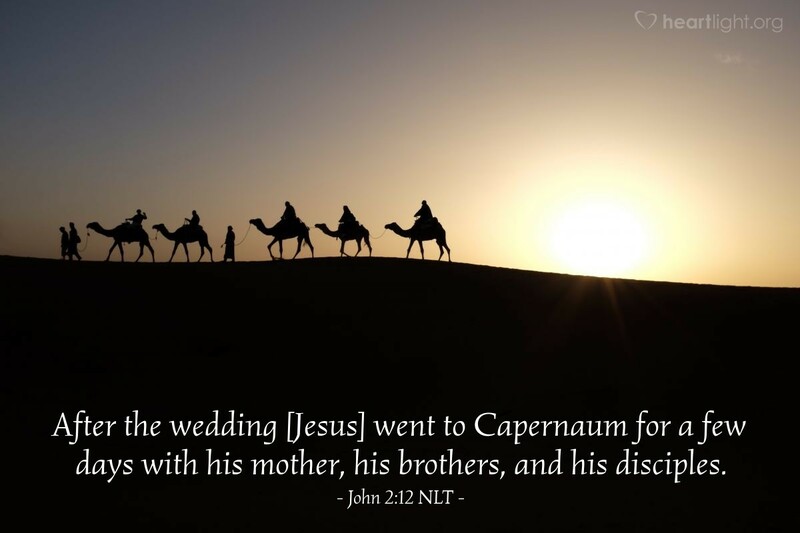 After the wedding [Jesus] went to Capernaum for a few days with his mother, his brothers, and his disciples. Ministry can be euphoric. Ministry can be discouraging. Ministry can be dangerous. In fact, the euphoria can be more dangerous than the discouragement. Many of God's greatest servants faltered in times of victory and success. Jesus, however, frequently gets away from the mayhem of the masses. Regularly he gets away for time to be alone with God. Frequently he gets away to be with his closest disciples. Occasionally he gets away simply for time with his family and friends. Those of us who want so much to serve Jesus must learn this vital lesson: We need rest, we need nourishment, we need friendship, and we need family. Let's not let the euphoria of being used by Jesus lead us to an arrogance that we don't need others. Father, forgive me for trying to hoard my experience of you to myself. Give me a sense of balance, a holy sense of rest, and a genuine sense of value in being with people I need and who need me. In Jesus' name, I pray. Amen.